Teachers who deposited money in Islamic lender Bank Asya, which was seized by the government, for its interest free accounts have been dismissed from their jobs in state schools, Yeni Çağ daily columnist Ahmet Takan has said. Sharing letters from his readers in his column on Oct. 23, Takan wrote about two teachers who were dismissed as part of a recent massive purge of teachers following a failed coup attempt on July 15 for which the Turkish government pins the blame on the Gülen movement, a civil society movement inspired by the views of US-based Turkish Islamic scholar Fethullah Gülen. Turkey’s once-largest Islamic lender, Bank Asya was seized by the government in 2015 for its alleged links to the Gülen movement. One of the teachers whose letter Takan shared in his column said she had never had contact with any institution, school or person from the Gülen movement, except that she opened an account in Bank Asya thinking that because it was an Islamic lender, her money will not be touched by the interest that is forbidden in Islam. “It was only TL 1,478 ($481) that I deposited in Bank Asya when I was pregnant, and I kept it there for only two months. I think this is the reason for my dismissal. However, it was a legal bank permitted by the government at that time,” she said. Another teacher said he had been in the profession for 25 years and has to look after two sons and a daughter since splitting up with his wife. “It was September 2014 when I deposited TL 1,500 ($488) in Bank Asya as my father had lent it to me because I was unable to work at that time due to sickness. I deposited the money in Bank Asya because it was the closest bank branch to my hospital and because I thought I should not be involved in interest banking anymore. After a few months, I heard my colleagues talking about the bank being linked to FETÖ (a derogatory term coined by the government to refer to the Gülen movement), and then I withdrew my money. I am not a terrorist, but a teacher. I want to return to my job,” he said. 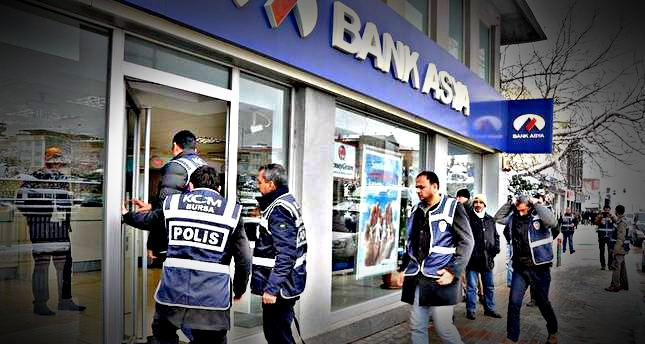 The ruling Justice and Development Party (AK Party) seized Bank Asya on dubious grounds in May 2015, suggesting that the lender’s financial management posed a threat to the Turkish banking system. The bank’s shareholders denied the allegations and vowed to take legal action. No court decision has yet been made. Established in 1996, the bank services its customers with 200 branches across Turkey. Since the bloody coup attempt on July 15, more than 100,000 people, close to 40,000 from the Education Ministry alone, have been purged from state bodies, over 72,000 detained and 33,000 arrested due to alleged links with the coup and the Gülen movement. Arrestees include journalists, judges, prosecutors, police and military officers, academics, governors, housewives and even a comedian.